COPS want to make crime a thing of the past in Sunnyside, Tshwane. This comes after top cops visited the dangerous neighbourhood on Saturday. They met residents and business people at Bronberg Church. 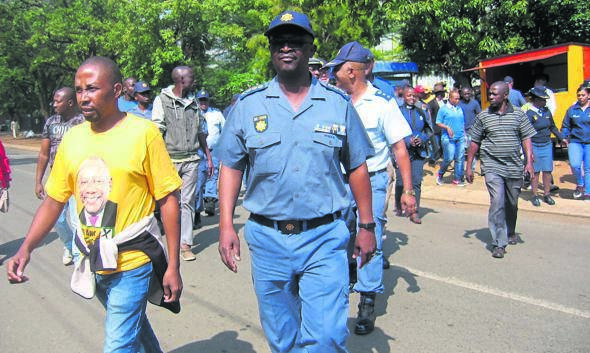 Gauteng police commissioner Lieutenant-General Elias Mawela, Tshwane district commander Major-General Daniel Mthombeni and Sunnyside acting station commander Colonel Nishan Moodley inspected the area to identify crime hot spots. “I have identified 40 police stations in Gauteng dealing with high levels of crime,” said Mawela. “These include Sunnyside Police Station, Pretoria Central and Joburg Central. “We are visiting them to meet stakeholders so we can come together to fight crime. Mawela said he had told the station commander to arrest cops involved in corruption. “Sunnyside is known for being a place where young people are killed with knives. “These knives must be removed from them,” he said. “The community will only give police information if there’s trust. “We can start by arresting our own police for corruption. Tshwane Metro police director Basil Nkhwashu said they would do more to enforce by-laws. “We will remove illegal informal traders. Those who don’t have licences should apply to the local economic development department,” he said. Reverend Joel Mayephy from the Community Policing Forum complained that flats were overcrowded. “But Mawela has given us hope. “He’s rebuilding the trust between the community and the police,” said Mayephy.